This is my American made bright silver plate Breast Cancer Set for rosary makers. The engraved Open Work Crucifix is 1 7/8 inhes tall (including the ring) by a little over 1 inch wide. The St. Agatha Charm is 1/2 inch tall by 1/4 inch wide and the engraved Roses center is 1/2 inch wide by 1/2 inch tall. This design is protected by copyright and can not be reproduced without permission. Click here for information about St. Agatha including her background and patronage. 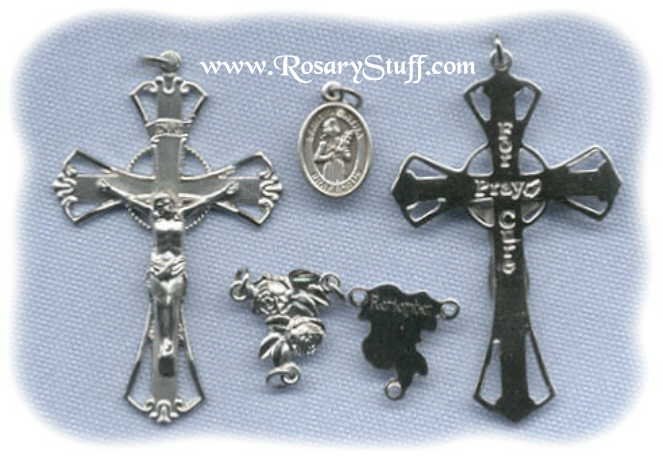 Priced per set (center, crucifix, & medal).